The VIVID – Vibrant Visions In Design Awards is a furniture design competition held in Australia, as part of the Furnitex exhibition event, running in tandem with the State of Design Festival in Melbourne. It features the 50 most inspiring and talented designers in Australia for the year with their unique product designs. There are four different categories to participate in: Commercial, Concept, Student and Green. Joseph’s design of the MEW Modular Coffee Table was inspired by traditional Japanese wood joinery and modern cutting technology capabilities. The design is a simple, versatile and interactive modular coffee table that can be rearranged to suit different individuals needs with its three smaller separate tables. Made from water-jet cut locally sourced Hoop Pine plywood, it uses various types of unique slotted connections that allow it to be easily assembled without fixtures or fittings and comes flat-packed for easier transport and storage. We would like to congratulate Joseph on his achievement. Click here to find out more about the VIVID Awards. 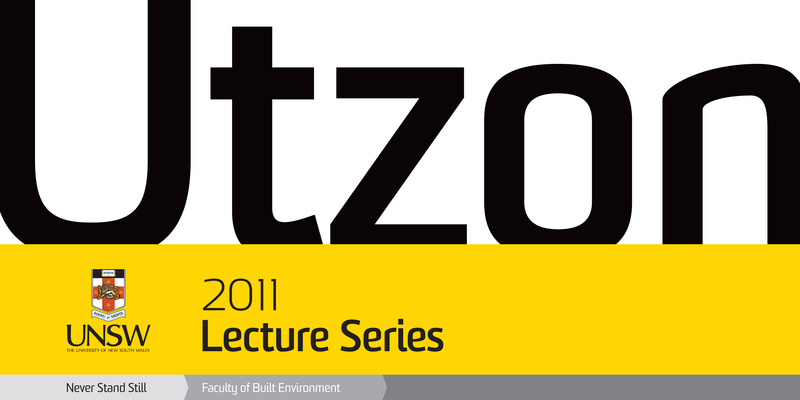 The next instalment of the 2011 UNSW Built Environment Utzon Lecture Series will be held on Wednesday the 13th of July in the Faculty of Law Lecture Theatre G04 at 7pm. The lecture is titled “Building Values” and will be given by world renowned philosopher Peter Singer, Professor of Bioethics, University Centre for Human Values, Princeton University, USA. This lecture will discuss the way in which our decisions about the kind of built environment we choose to create, and to live in, should take into account the interests of others, whether present or future, human or nonhuman. Saturday in Design is an annual trade event for the design community, which began in Sydney in 2003, and now alternates each year between Sydney and Melbourne. This year will see Sydney showcased on 19 – 20 August 2011. This event is an opportunity to see what Sydney has to offer in the field of furniture and design. It involves Australia’s premier designer furniture, finishes, fixtures and lighting showrooms opening their doors on a Saturday to allow architects, designers, students and design-savvy members of the public to enjoy these companies’ products in an ‘open house’ environment. Saturday in Design has traditionally been an opportunity for local and international products from hundreds of reputable brands to be launched to thousands of members of the design community in one day. To enable hassle-free travel in between showroom venues around the city, a number of complimentary shuttle buses run on pre-arranged routes for the entire day. Click here to find out more about Saturday in Design. Hi my names Eric Chau and I’m currently studying industrial design in my fourth year at UNSW. Entrepreneurship has always been lingering in the back of my mind but I have never had enough confidence to pursue it at this stage of life, however things have changed since I entered the TIE Clash of the titans youth pitching competition. It all started when I enrolled into the entrepreneurial course and was notified of a pitching competition and its prize – A trip to Silicon Valley to attend the TIECON 2011 with expenses paid. Entering the TIE Clash of the titans youth pitching competition has been an experience which has been life changing ever since. The whole process from the preparation of the pitch to meeting successful entrepreneurs in Silicon Valley has enabled me to learn so much in a short amount of time. Everything has happened so quickly, from having 1 week to organize my trip to the USA and having up to 6 assignments due when I was to arrive back in Australia. This has taught me the value of time management. The whole trip to the TIECON in the valley entailed so many highlights. The whole conference was packed with a variety of like minded people which ranged from entrepreneurs to venture capitalists all gathering around pitching business ideas and networking. I loved the atmosphere, environment and the drive everyone at the conference had, I also took advantage of this and networked with people from all over the world who attended this conference. The other main highlight attending this conference was the amount of information I have absorbed in from the various keynote speakers and guest panel speakers. All of the speakers were very inspiring in giving talks on their insights to the highs and lows of becoming an entrepreneur. The third instalment of the 2011 Utzon Lecture Series “Sustainable use of Public Space: Cities for Walking, Cycling and Transit” by Lars Gemzøe, Associate Partner, Architect MAA, Gehl Architects, Copenhagen, Denmark is now available for viewing on UNSWTV.